The discrepancy between reported levels of consumer interest in buying green and actual in-market success of greener products suggests that pollsters and consumers have different ideas about what it means to be green. Ottman assets that pollsters need to ask different questions. With carbon footprint and energy independence on everyone's minds, many marketers are looking to capitalize upon their products biobased content. This article explores how the USDA Certified Biobased Label helps translate Biobased Content into marketing Benefits. Eco-labels are an excellent way to enhance credibility for green marketing claims, but they are not without risk. While 28% of consumers look to green certification seals or labels to confirm that a product adheres to claims, these labels can also confuse. Happily there's enough method within the madness for marketers to pave a way forward. Today’s consumers want to know the back-story about products and packages, so focus on primary benefits in the context of a full story that incorporates the environment as a desirable extra benefit. 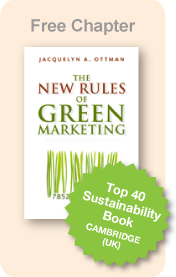 In this “green paper” Jacquelyn Ottman, founder and principal, J. Ottman Consulting, Inc., proffers that greenwash is a symptom of a larger problem that is preventing consumers from getting more involved in sustainability efforts. Diagnosing the problem as an immature “eco-system” surrounding the fast growing green marketing industry, she suggests steps the industry can take to build the holistic support it needs from retailers, government, and especially consumers in moving sustainability forward. It is not enough to simply buy green products. Consumers must extend their conscious behavior into the home. In this article Jacquelyn A. Ottman explains that manufacturers and marketers should not only design products that use resources efficiently, but—representing an important new frontier for green marketing—they should encourage consumers to use them efficiently during the all-important "use", "after-use" and "disposal" stages of the product's life cycle. Jacquie Ottman discusses how "green has [become] mainstream" in past, present, and future generations. Eight myths about green products and insights into how the Hispanic market may be just as green as the mainstream in general. Jacquie Ottman discusses the consumer revolution that is driving the phenomena of sustainability marketing outlining six new rules being written by consumers for manufacturers and marketers. While in the past consumers bought solely on price, performance, and convenience, today they are increasingly making their purchasing decisions based on additional criteria such as how products are sourced, manufactured, packaged, disposed of - and even such social aspects as how factory and farm workers are treated -- now all of these other factors also matter.